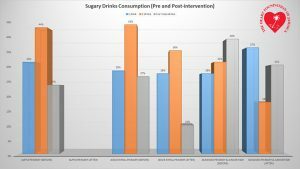 Specific project outcome: Pilot project implemented and recommendations formulated for reduction in the consumption of sugar-sweetened beverages (SSBs) and increase in consumption of water in primary level schools in Jamaica. Prior to executing the project stakeholders were sensitised about the project and pledged to support the implementation of the intervention to reduce SSB consumption and increase water consumption in select primary schools. The intervention was piloted in Alpha Primary, Jessie Ripoll Primary and Seaward Primary and Junior High schools. A stakeholders’ meeting was held on March 27, 2018 to provide sensitization prior to intervention implementation. Those represented were from the Ministry of Education (MoE), National Water Commission (NWC), Ministry of Culture, Gender, Entertainment and Sport, along with the teacher coordinators of the pilot schools. NWC committed to providing bottled water for Water Days and water quality reports on each school. Vendors showed support for the initiative and helped with the control of water sales during and after school. An Action Plan to reduce the consumption of SSBs and increase the consumption of water in primary schools was presented to key stakeholders on April 12, 2018 and April 26, 2018. The stakeholders were pleased to be on board and bought into the concept of gradually eliminating the sale of SSBs in schools. The communication plan outlined the communication strategies that were undertaken to make the project a success. 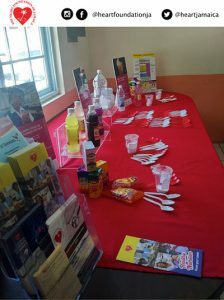 The main target audiences included the Healthy Heart Club (HHC) members, vendors, school administrators, general school population, parents, teaching staff and stakeholders. The main media used included PowerPoint presentations, social media, WhatsApp group, branded aprons, notice board banners, posters, props, team leaders at the schools and oral presentations at the schools’ general assembly. The NWC team assured the HFJ and stakeholders at meetings that all 3 pilot schools have potable water. Students were also reassured that their tap water was safe to drink. NWC water-quality reports were prepared by the technical team and submitted to the HFJ on August 3, 2018. The reports gave a detailed breakdown on the source and quality of the tap water provided to each school. The reports showed that the water quality for all three schools was up to standard. Presentations on the dangers of consuming SSBs and the benefits of drinking water were done on a weekly basis at HHC meetings throughout the duration of the project. Presentations were also held at Parent Teacher Association (PTA) Meetings. Branded Aprons were purchased and delivered to school vendors at the pilot schools to promote water consumption. Aprons were branded with the HFJ logo and slogans about water. 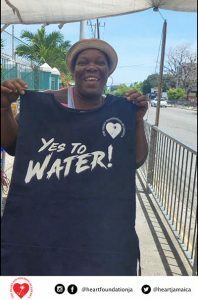 The Health Promotion Officer (HPO) and volunteer from the Caribbean Institute for Health Research (CAIHR), University of the West Indies (UWI), created photos or video messages with the vendors in support of increased consumption of water. Informational posters were designed and printed and posted throughout the pilot schools. Posters were also circulated on social media and within the WhatsApp group. The Water Days for each school were agreed on and implemented. On Water Days students were required to drink only water. Some carried water from their homes, while others bought from vendors and the school canteens. No SSBs were sold in the schools’ canteens on those days and the vendors withdrew their SSBs. These actions contributed to the success of Water Days. 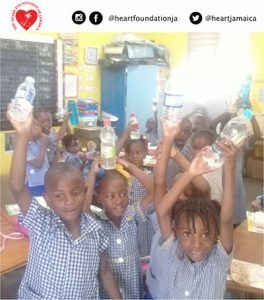 The NWC specially pre-packaged bottled water for the HFJ and distributed to the 3 main pilot schools for their Water Days. Peer ambassadors were selected by the HHC teacher coordinators and were actively involved in promoting the drinking of water and sharing the dangers of SSBs with their peers. Their influence made a difference in curtailing the overall consumption of SSBs in the school population. Weekly informal medical quizzes were done at each HHC throughout the duration of the project. The quizzes asked simple questions about the effects of consuming too much sugar and the benefits of water. GHAI project representatives joined in stakeholders and schools’ administrative meetings and presented on the GSHS, the scientific evidence that supports the campaign. Creative props such as sample labels, models of actual SSB bottles/boxes were used in presentations to all stakeholder groups. Water coolers were donated to pilot schools during the project. Re-fillable 5-gallon bottles of water were also donated with the coolers. A team from the HFJ in collaboration with the NWC PRO team visited each school and conducted the presentations. 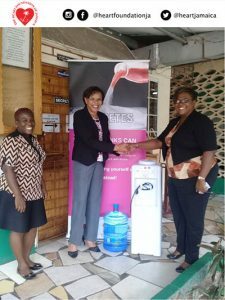 Corporate Hands | Heart Foundation Donates Water Cooler To School – Jamaica Gleaner, July 19, 2018. Surveys were conducted before and after the intervention was implemented in the pilot schools to see if water consumption patterns had changed. 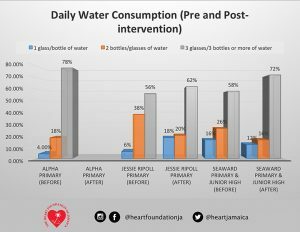 Data from the pre and post-intervention surveys at Jessie Ripoll Primary and Seaward Primary and Junior High showed a marked decrease in consumption of SSBs and considerable in the consumption of water at both schools. At Seaward Primary and Junior High, 88% of respondents acknowledged that water is being promoted at the school. 96% said that Water Day has motivated them to drink more water and 98% think that Water Day should continue. 92% said that they have learnt about the dangers of drinking too many sugary drinks and 98% said they plan to drink less sugary drinks from now on. At Jessie Ripoll Primary 84% said that water is currently being promoted at the school. 83% said that Water Day has encouraged them to drink more water and 96% think that Water Day should continue. 98% said that they have learn about the dangers of drinking too many sugary drinks and 92% said that they plan to drink less sugary drinks from now on. These results show that the intervention strategies executed had a profound impact on the schools’ population. Positive feedback was received from school populations, HHC coordinators, parents, vendors, and teaching staff regarding the benefits of the project. Parents have expressed that they have seen changes in their children’s behavior towards SSBs. One parent shared a testimonial, how his son lost approximately 17 pounds by changing his eating habits and reducing his consumption of SSBs. One teacher related how one of her students saw her with an SSB on her desk and reprimanded her for not setting the right example for the students. Respective vendors, when interviewed, expressed that the Water Days went well and commended us for the work we were doing. The principal of Seaward acknowledged that there was a marked decrease in the sale of SSBs and a significant increase in the sale of water at the school canteens. She stated in June that for every 2 boxes of SSB that they sold, they sold 10 cases of water. This was a remarkable achievement. Recommendations were drafted for decreasing SSB consumption and increasing water consumption for adoption by the schools and possible incorporation into national guidelines and the National School Feeding Policy. Invite nutritionists and health educators to conduct health presentations on the dangers of SSBs to the staff and students and PTA of the school. Implement weekly Water Days in which all SSBs are removed from the school canteens and only water and fruits are promoted as substitutes. Invite vendors to join in the Water Way activities, encourage them to withdraw their sale of SSBs and give them incentives for participating. Identify teacher coordinators and student peer ambassadors that will lead the promotion of reducing SSB consumption and the drinking of more water among the student population. Provide teachers with incentives for their support of this extracurricular activity. Utilize nutritionists to conduct evidence-based education sessions with parents. Seek parental support for their children to reduce or limit the amount of SSBs they provide for their children and substitute them with water. Seek collaboration with a major water supplier such as the National Water Commission through its public relations representatives to assure students and staff that the tap water is safe to drink. Water quality reports could be used to support these presentations. Ensure that adequate drinking water outlets within the schools are available for students to use both for drinking and refilling of bottles. 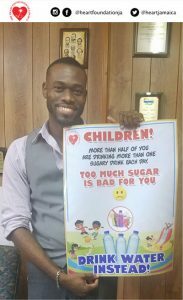 Create and distribute posters with messages that promote the habit of drinking more water among students. Conduct pre- and post-intervention surveys to determine the effectiveness of the initiative(s). Develop a plan to monitor the progress of the initiative(s). 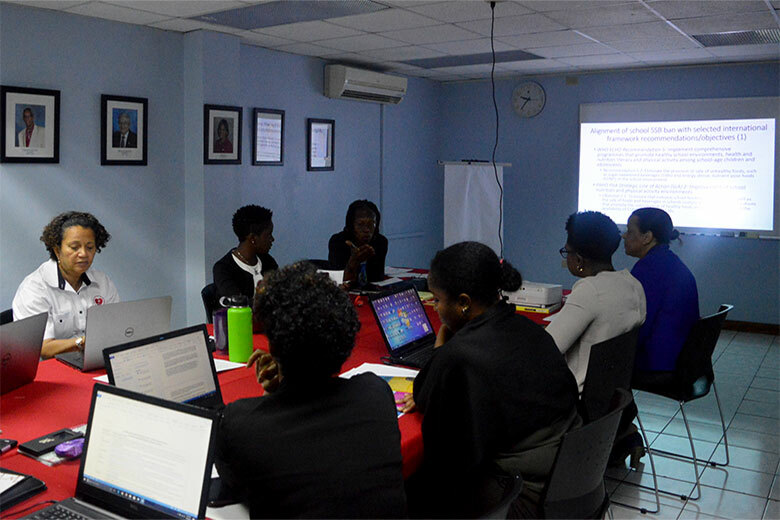 The CDB grant funded CSO capacity building workshop took place at the office of the Heart Foundation of Jamaica (HFJ), in Kingston, Jamaica, 30-31 January 2018. The workshop, usually of three days duration, was held over two days, due to the HFJ’s pressing commitments. Ten HFJ staff members participated.